When Wilton Park conferences are not being held, the facilities at Wiston House may be hired by the public. Owing to the exclusive location, historical charm of the building and natural beauty of the gardens, the house is extremely popular as a local wedding venue with civil ceremonies held in our public rooms and St Mary’s church is used for blessings. The house is also used as a venue for professional training workshops, family gatherings and music events like the Big Church Day Out. We host events during Steyning Literary Festival and hold tours of the woods and gardens at the summer Steyning Festival. Wilton Park’s 72 staff predominantly reside in the surrounding Sussex area and we encourage car shares between local colleagues. The longevity of service, average 8 years, encourages and is a testament to the strong bond of friendship among colleagues which we cultivate with regular formal and informal gatherings. Often organised by our Staff Committee, these include local walks, quiz nights and fundraisers for charities such as the 4Louis and Chestnut Tree House. 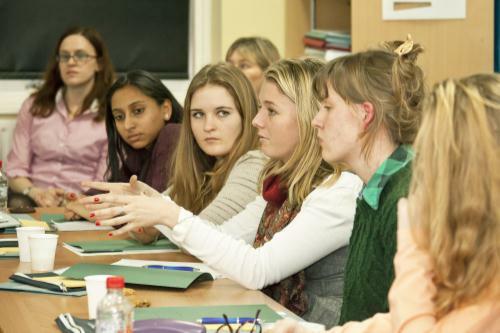 Last year, twenty sixth form college students from Steyning Grammar School were selected to participate in a new discussion group programme run in partnership with Wilton Park. These discussions will take place twice a term and two have taken place so far in 2014 with more planned for later in the year. As part of this first discussion, session students were asked to do some background reading relating to two interrelated questions within the overall theme of conflict and security. Two of our Research Associates facilitated a group discussion concerning the nature and purpose of armed forces in the modern world and the Syrian civil war. These topics prompted differing responses from students and encouraged meaningful conversation and debate. Our facilitators actively sought alternative views from the students as part of the process and encouraged students to draw their own conclusions. In our last staff survey, 79% of us said that we were proud to be part of Wilton Park. We have the privilege of working for a local company which promotes peace, wealth and fairness in the world, with beautiful surroundings, interesting clients, and motivated colleagues.